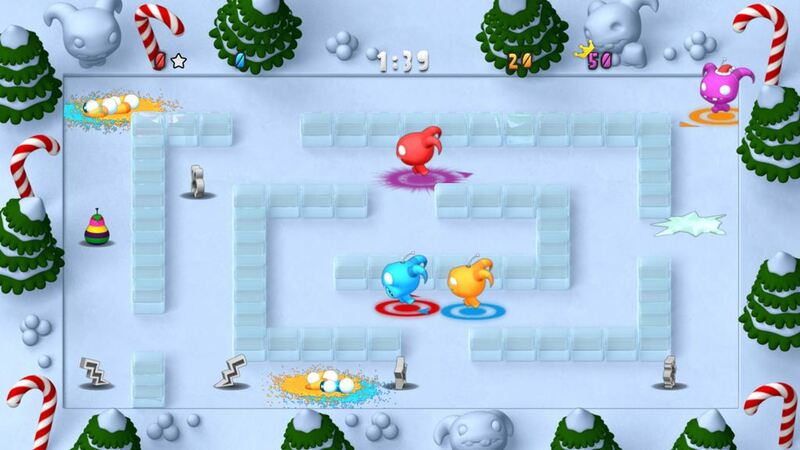 Chompy Chomp Chomp pits four Chompys of different colors against each other in a hectic battle royale, where it’s chomp or be chomped, but there’s a catch: You can only chomp a specific Chompy, defined by its color – let the battle commence! To help you (or your opponent) gain a temporary edge, both defensive and offensive power-ups are also part of the chaos. It was released back in May, but that was then and this is December, so how about getting into the festive spirit with some free DLC? While not everyone celebrates Christmas, that hasn’t stopped Utopian World of Sandwiches from spreading holiday cheer, with free content for their Chompy Chomp Chomp. According to the developer, the update adds “6 new levels and a festive theme with santa hats”, which means even more fun for those who can gather a bunch of people on the couch for some Chompy fun; alternatively, you could just chomp across the Internet, since it has online multiplayer too. And for practicing your chompin’ skills, there’s even an offline mode with (quite competent) bots to chomp. It’s available on XBLIG ($1/80 Microsoft points) right now, so what are you waiting for? It’s chompin’ time! Chomp and roll ou– okay I’m done.